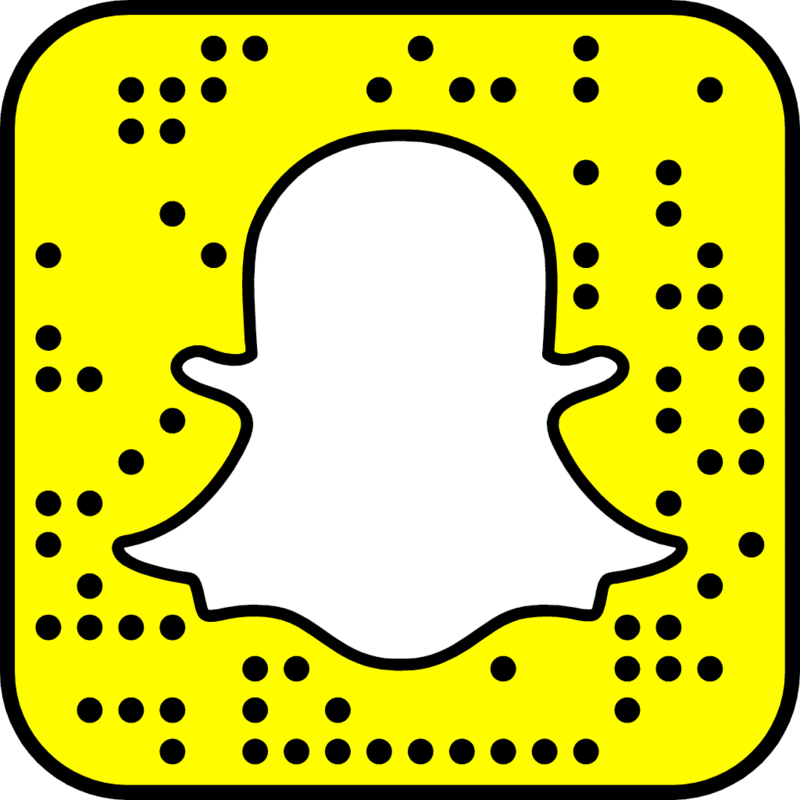 As some of you may know from my Snapchat, I have recently recovered from a strange under-eye rash that had been bothering me since the end of February. It started out small, only under one eye, and then it spread to both eyes. 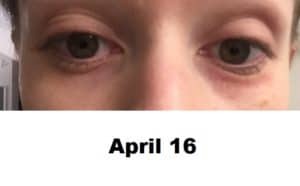 My vision/ eyes were not affected whatsoever–just the skin underneath them (lower eyelids). While trying to figure out a cure, I went searching the internet and only found a couple of useful articles…and almost zero photos. So…I’m writing this in the hopes that someone else may find use/benefit from my experience! I was about to delete all the pics from my phone but decided that they would be useful for this article. Also, if there’s anyone out there who has had a similar reaction before, let me know in the comments! 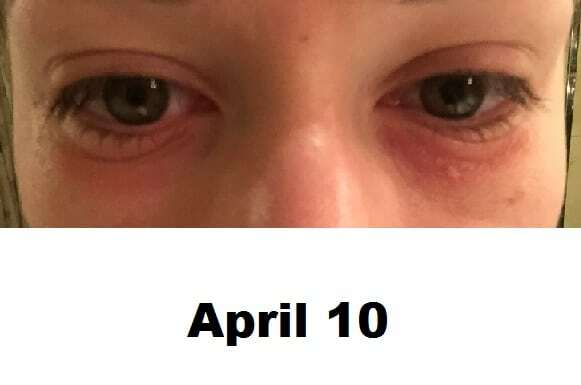 As a preface note: I’ve never had an allergic reaction like this before, no history of eczema or psoriasis, no food allergies that I know of, and no allergic reactions before except to Mary Kay makeup when I was young, and another time in Dubai I got hives from something I ate (to this day I wasn’t sure what it was). 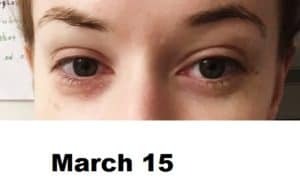 I woke up one morning near the end of February with a tiny rash on my lower eyelid. It was small, and I figured I must have scratched myself in my sleep or something like that. I didn’t take it too seriously. I usually wear concealer, so it didn’t affect my daily routine…just something strange I saw in the mornings and then evenings after washing off my makeup. A couple days later, it was still there. And it hadn’t gotten any smaller. In my ignorance, I got some Vaseline to put on it at night…which didn’t help. 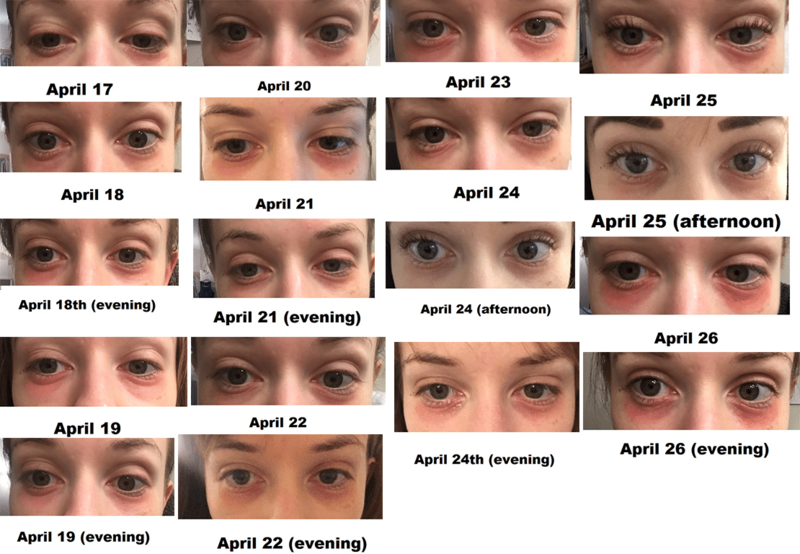 About two weeks later, I decided to go see an optometrist–I figured I must have done something wrong in caring for my contact lenses or maybe my tear duct had gotten clogged. 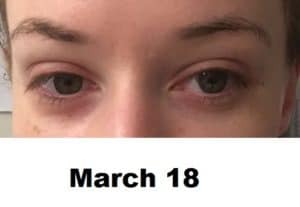 I was instructed to use a warm compress for five minutes twice a day, then the eye scrub sheets, and then a prescription eye drop for good measure. Which is better than it looked on the 13th! I did what the doctor said — religiously, to the letter. And my eye seemed to be getting better! …I was a bit impatient because I was filming on the 17th…but it was almost gone by then! As you can see — it wasn’t fully gone, but it seemed to be better. As you can see, not much progress…and covering it up with concealer didn’t help much-esp. when the skin was peeling! 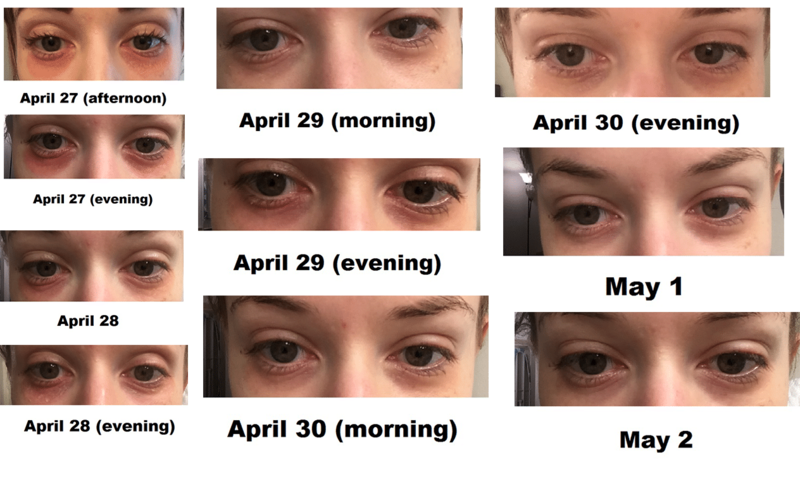 At the time, I thought it just wasn’t hydrated enough…but even La Mer “the eye” concentrate couldn’t cure it. As you can see — slightly better? But maybe it was just the lighting! I made an appointment to see a dermatologist. When I met with her on the 17th, she informed me that I am suffering from an allergy. She reminded me that the skin under the eye is more sensitive than our skin anywhere else, and to be cognizant of the kinds of shampoos, creams, makeup, and fragrances I’m coming into contact with. Well, the pre-authorization took nearly 2 weeks. 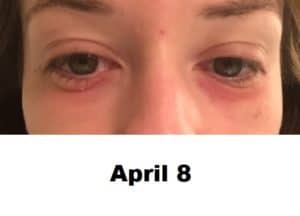 Here is how the rash fared (mind you, I learned the hard way that putting Vaseline on a rash like this makes it worse– putting it on at night will make your eyes puffy in the morning!). April 27th was a Friday–it was the day I found out they had re-submitted the pre-authorization because my insurance had denied the original request (because the doctor had written “eyelid dermatitis” instead of “atopic dermatitis”!) The doctor told me to use hydrocortisone cream 1% (the one you can get from CVS for like 5 bucks)– twice a day until the medication is approved, then I should switch to the tacrolimus. How did I apply it? 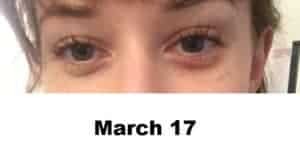 I first applied my own eye cream, then waited about 10 minutes for it to be absorbed before applying the cortisone. As you can see, I woke up to a huge improvement on the 29th! 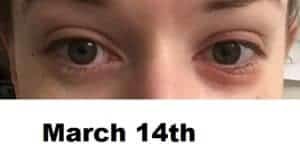 I applied the cream on Sunday morning and evening, and then on the 30th in the morning. During the day they informed me that my prescription was ready to be picked up! I wasn’t sure I needed it at that point, but picked it up anyway and used it that night and also on May 1st in the evening. 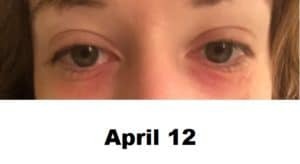 I had read reviews about Tacrolimus causing a burning sensation — it felt a little warm throughout the night–not burning, but warm. 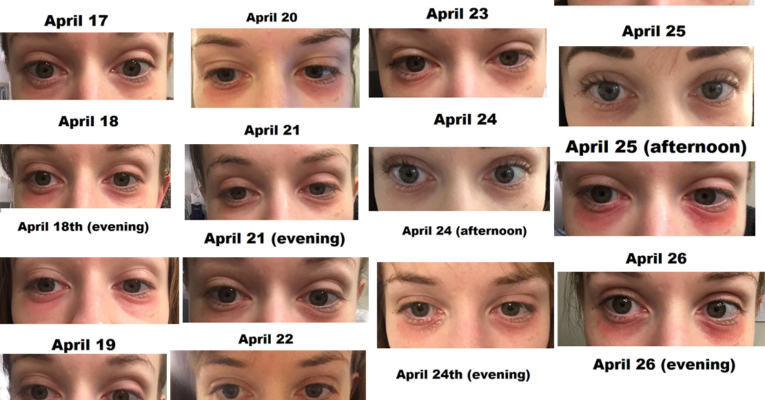 By May 3rd I stopped taking photos because it looks almost 100% back-to-normal! However, I still to this day have NO idea what the allergy is/was, so I am doing the allergy tests in the coming weeks! Wish me luck! P.S. I really hope I’m not allergic to gluten…or milk…because I love ice cream & cookies. What was the outcome of your allergy testing? 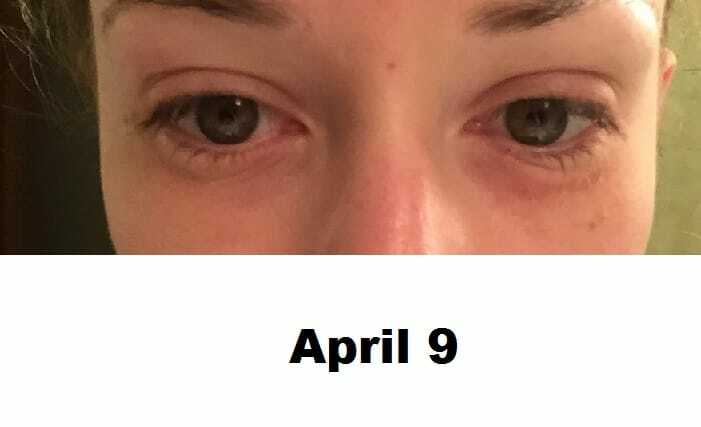 My daughter woke up with the same weird under the eyelid rash this morning – she’s 4. So thankful for your article! 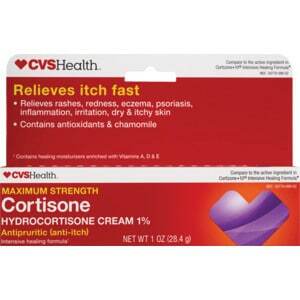 We will try hydrocortisone cream tomorrow! Crazy! And you’ve had no recurrence to date? 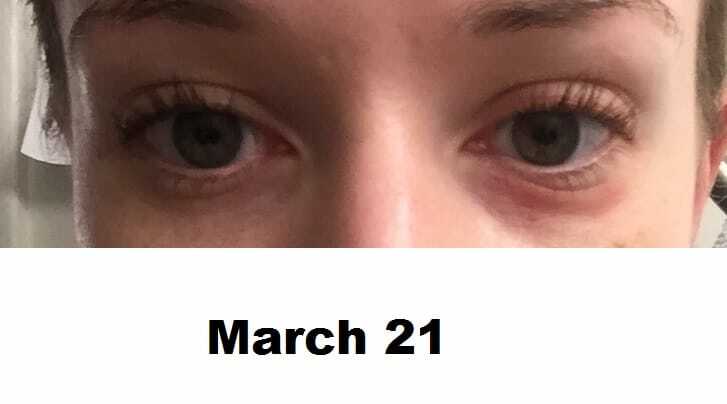 Not as bad as before — if I feel that it looks a bit red, I put on some tacrolimus or hydrocortisone before going to bed and it’s all cleared up by morning! Hope this helps! Hopefully daughter’s rash clears up quickly. I have the same thing…I’m going on about 2ish weeks and nothing I use seems to make any difference. I used a eye cream last night and it seemed to make things much worst. But I will be going out tomorrow to try that anti itch cream. 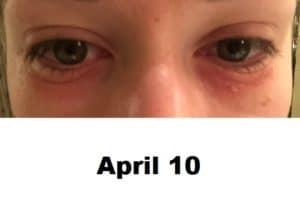 I also do not have any previous known allergies. I also dont wear makeup (which I did yesterday so that could also be why my eyes are worst today). My experience is the same I thought I scratched under my eye WAY too hard until I noticed it on the other side too a couple days later. It’s a little itchy and a little stingy but nothing unbearable and nothing really noticable unless I’m focusing on it. I have a doctor’s appointment set up but I’ve had no luck with doctors lately and I have no faith in them at this point. What ever kind of rash makes me feel and look absolutely ridiculous. Oh wow! Hope the appointment went well and that you are doing better now…when I wrote this post I had no idea how many other people would relate! Hope that the cream helped! OMG! The EXACT same thing has been happening to me on an off for almost a year now!! 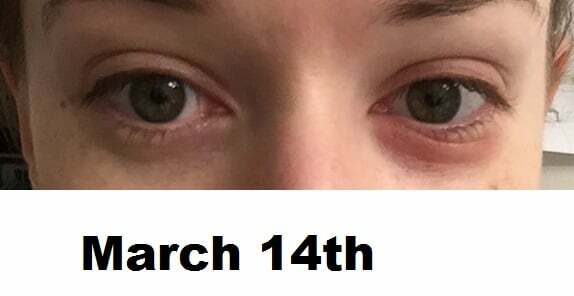 I haven’t been able to find anyone else who also experiences the rash ONLY under the eyes. 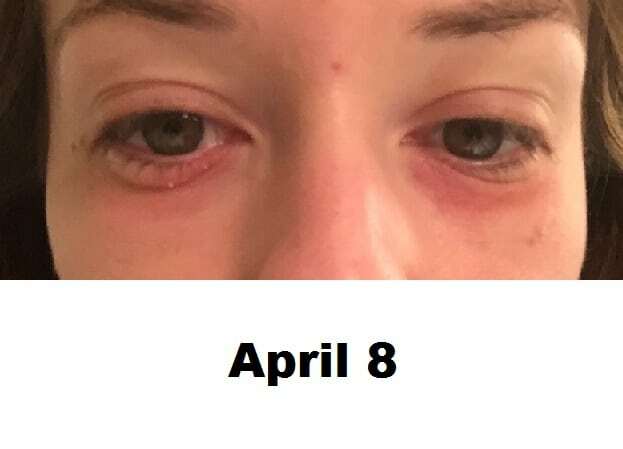 Its so frustrating I literally just got back from the doctors where I was prescribed an antihistamine for my mystery allergy. Thanks for posting, makes me feel a little less crazy that this is happening to someone else!